Have you noticed how an airplane pilot goes through a specific checklist with the co-pilot before taking off? It's important for them to prepare so that their passengers have a safe flight! Similarly, next time change the batteries in your smoke detector or change the clock for daylight savings, review this checklist to make sure you continue to take the right course of action to prevent falling. 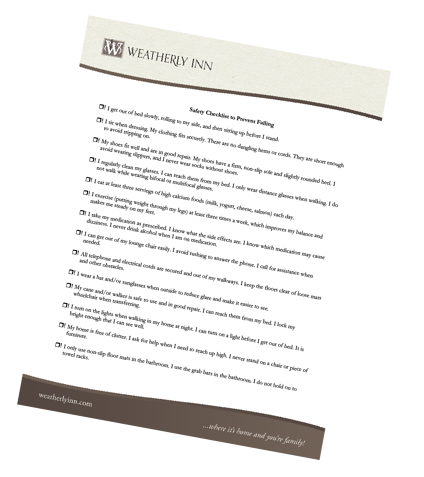 We created this Safety Checklist to help remind you and your loved ones of the best practices to prevent falling. Fill out the form below to receive our Safety Checklist! What email address shall we use?